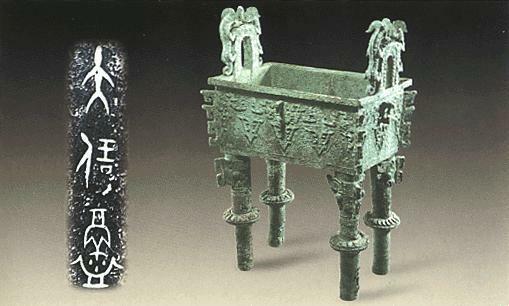 In 1958, the descendants of Xu donated this to Tianjin Museum. 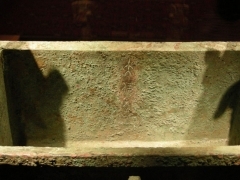 Taibao ding is a square vessel, with two handles on each side. Some crawling beasts were cast on the handles. On the main body, beast face patterns and leaf patterns took most area with several spines. On the legs, there are four (one on each) delicate disk designs, which is quite unique. Inside the vessel, there are three inscribed characters, saying, “太保铸 (Cast by Tai-bao)”. Tai-bao is the name of an official position. This “Tai-Bao” specifically refers to the infamous West Zhou Minister: Zhao-gong-Shi. This is the 12st of 64 culture heritages that the government of China forbids to exhibit abroad. The complete list is here. In Chinese.